As old school as it gets, Enforcer won’t be changing their tune anytime soon. Formed as a solo project by singer, guitarist and songwriter Olof Wikstrand in Sweden in 2004, Enforcer was created to pay homage to the sound, style and spirit of classic 80’s metal. Fifteen years later, Wikstrand’s vision has spawned five albums, the most recent of which is Zenith. The first to feature new guitarist Jonathan Nordwall, it shows a band continuing to hold the torch well aloft for the spirit of classic heavy metal. Eschewing the thick sound and heavy guitar crunch that modern production styles bring to the genre, Enforcer sounds like a band that fell out of a vortex directly from the mid-1980’s. Fans of the band’s previous albums won’t be disappointed by the latest release, which holds true as ever to Enforcer’s devotion to a time older than Wikstrand himself. 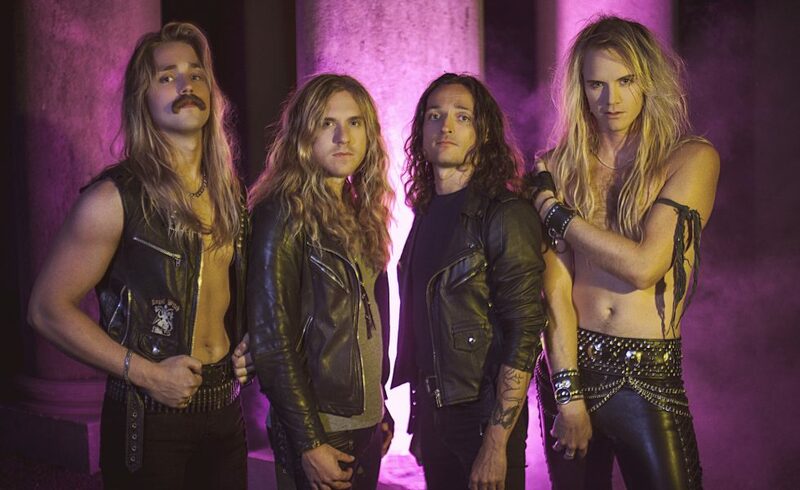 Zenith combines straight-up classic metal like early Iron Maiden with the later speed of bands like Exciter and Jag Panzer, and the melodic sensibilities of Scorpions, then peppers it further with hair metal-style riffs and backing vocal chants. They even drop in a long piano-driven power ballad. No matter how good your new stuff is, some fans are always going to prefer what you’ve done before. Because that’s when they discovered you, that’s what they associate with you, those songs they discovered. He doesn’t apologise for doing exactly what he likes though. When pressed on whether he thinks Zenith will live up to what Enforcer’s fans have come to expect from the band, he quite assertively declares, “The only thing I care about or am concerned about is my own expectations.” On the other side of the coin, he admits that there are times when he isn’t certain those expectations will be met. He speaks with the air of confidence that comes from being in the game for half a lifetime. In the early days, Wikstrand covered all bases himself, from composing and singing to playing all the instruments. Now, he has the support and security of a full band to help him achieve his musical goals, and while but he’s careful to admit that endeavouring to up the ante with each release gets progressively more difficult, being part of a band makes it a whole lot easier. Pre-order Enforcer’s new album Zenith here.